Eagle of the sea: Often called the world’s most magnificent bird of prey, the Steller’s sea-eagle is dark, impressive, the largest of all sea-eagles, and the heaviest known eagle. Despite its large size and attractive appearance, its habits are not well known. The Steller’s sea-eagle is often easy to spot, with its dark body; white forehead, shoulders, tail, and thighs; and bright-yellow bill. It is believed that they are glacial relics that evolved in the narrow, northeast Asian coast and simply stayed there through multiple Ice Age cycles, never occurring anywhere else. 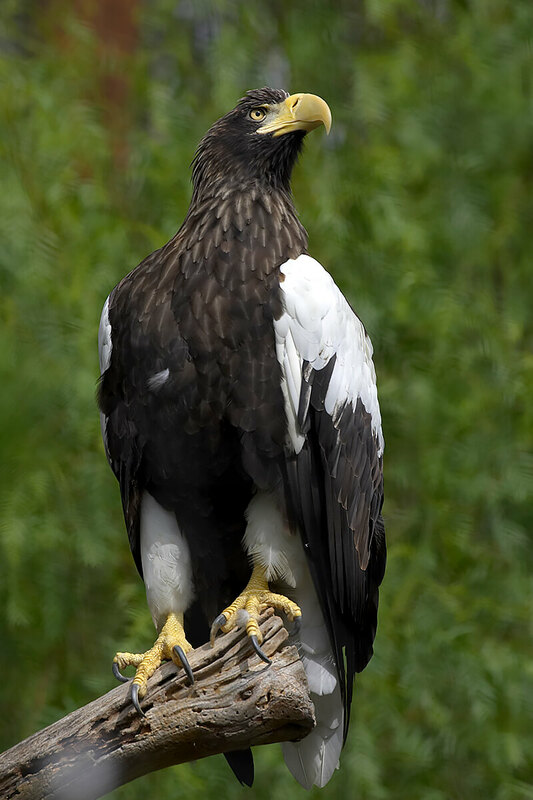 Other northern sea-eagles share the yellow legs, eyes, and beak of the Steller’s, and they are large birds as well, which seems to support this theory. A very rare raptor: One of the rarest raptors in the world, very little is known about Steller’s sea-eagles, due to the remote nature of their primary habitat, the rocky seacoasts and rivers of northeastern Siberia in Russia. These birds of prey spend much of the warm season in this region, and some stay here year round. Many others migrate slightly southward for the winter to the southern Kuril Islands and to Hokkaido, Japan, where food is more plentiful, but that's it—this is the only region of the world where this eagle is found! Like its other close relatives (harriers, kites, and goshawks), Steller’s sea-eagles use binocular vision to precisely pinpoint the location of their lunch. Both eyes are set on the front of the bird’s head and focus on the same thing, providing depth perception. This is an important tool if you are diving more than 100 feet (30 meters) while trying to catch your food! This diurnal, fish-eating raptor mainly eats salmon and trout. Yet the Steller’s sea-eagle can be flexible in its dietary habits and is an eater of all things protein—dead or alive—including puffins, fish, crabs, and even deer carcasses. This is a sensible survival strategy in an extreme environment. The birds spend much of their day perched on sea cliffs or trees, their “eagle eyes” on the lookout for food, ready to swoop in on a hapless victim. Like all raptors, they clamp onto prey with talons as sharp as switchblades and cannot let go until the prey is dead. Like bald eagles and brown bears, the eagles take full advantage of the annual salmon run to gorge themselves on the spawning and dying fish. Steller’s are also known to hunt while flying and take small mammals, fish, and seabirds by swooping down and catching them with their talons. These eagles have even been seen standing in shallow water or on the ice, grabbing fish as they swim by. And, like other eagles, Steller’s sea-eagles also steal food from other birds; this is known as kleptoparasitism. At the San Diego Zoo, our Steller’s sea-eagles are fed rabbits, rats, and fish on rotating days. Like many of our carnivores, the birds also have fast days where no food is offered so their body can have time to digest the previous meal. Sea-eagle nests are called aeries, and they are built high in dead or open-topped trees near rivers or on rocky cliffs, up to 100 feet (30 meters) above ground. The massive nests they build sometimes contain 400 or more large branches. The nests are seldom built far from the shoreline, which puts the eagles in proximity to the fish that make up the bulk of their diet. These open sites give the birds easy access to and from their nests. Typically, a pair returns to the same nest each year and adds a little more to it to prepare for the season’s clutch, but pairs sometimes build and oversee more than one aerie and choose which one to use each spring. Aeries can be 6 to 8 feet (1.8 to 2.4 meters) wide and can weigh hundreds of pounds. It is not uncommon for a nest to grow so heavy that the branches it sits on break, and the nest comes crashing to the ground. Steller’s sea-eagles make a deep barking cry, ra-ra-ra-raurau. During breeding season, they make calls that sound like very loud seagulls. Courtship occurs during late winter, and the female starts laying greenish white eggs in mid-spring. One to three eggs are laid; usually only one chick survives, but two and even three babies have been raised successfully. Chicks are altricial, with downy gray-white feathers that gradually change to brown. The young learn to fly when they are about 10 weeks old. The young birds consume about 1 pound (0.4 kilograms) of fish daily by the time they are 5 weeks old. Little is known about this raptor’s phase from fledging and the first winter migration until it reaches sexual maturity and attains its striking adult plumage. The birds may not even breed until much later. The San Diego Zoo received its first Steller’s sea-eagle in 1953 as a gift from a Japanese ornithologist. This bird awed Zoo guests for many years. Our next Steller’s arrived in 1996. Today, the Zoo is one of the few places in North America where you can view these impressive eagles. A pair of Steller’s sea-eagles lives in an aviary along the Zoo’s Eagle Trail. Eagles and humans: Steller’s sea-eagles are a vulnerable species and have been given complete legal protection in Russia, the only place it breeds, and in Japan, where it overwinters. Despite these protections, human behavior continues to harm the remaining sea-eagle population. In Russia, Steller’s are losing their habitat because of the development of hydroelectric power projects and logging in the forested areas where they nest. The rivers where the sea-eagles fish are being contaminated by chemicals from local industries. In Japan, sea-eagles eat both fish and carrion. Overfishing by humans in Japanese waters has led the birds to scavenge on sika deer remains left by hunters. Eating carrion filled with lead shot from hunters has had devastating effects on the sea-eagle population, leading to the outlawing of lead ammunition on Japan’s Hokkaido Island. As of 2009, the world’s population was estimated at 5,000 birds, but it is slowly decreasing. Still much to learn: Very little is known about these eagles, especially their early years. Research efforts began in 1992, at Russia’s Magadan State Nature Reserve. In 2006, San Diego Zoo Global and Natural Research, Ltd. teamed up with scientists there to study the movements of young Steller’s sea-eagles in their native habitat to determine the hazards young birds face, in hopes of protecting the species in the wild. Researchers survey nests, and a team member climbs the tree to collect a bird, gently placing it in a bag to be lowered to the ground. The ground crew measures, weighs, and takes tissue samples from the bird. Young eagles get a satellite leg tag so researchers can track its movement. The team was surprised to discover the extent of persecution these birds are exposed to, despite the species’ protected status throughout its range. Preliminary results show high juvenile mortality, with deaths associated with oil rigs. Nest productivity/chick survival is correlated to snow depth and resulting floods. Fishing and caviar harvesting are major industries in Russia’s Siberia, and they provide offal for sea-eagles to scavenge. However, overfishing can impact the birds’ habits, forcing wintering birds to look inland for food. There, they often prey on deer carcasses, which can contain lead fragments from bullets. Japan responded to this hazard by banning lead bullet use throughout the sea-eagles’ range within their country. Although legally protected in Russia, Japan, China, and South Korea, other threats to Steller’s sea-eagles include fossil fuel energy developments, wind farms, pollution, habitat loss, hunting, and possibly global warming. By learning more about the threats young sea-eagles face each autumn as they head off on their frosty migrations, it is hoped that this vulnerable bird population may stabilize. The San Diego Zoo has a pair of Steller’s sea-eagles and has loaned pairs of birds to four other zoos in the US. We hope that seeing these amazing raptors up close will encourage visitors to participate in the conservation of this rare species. You can help us bring Steller’s sea-eagles back from the brink by supporting the San Diego Zoo Global Wildlife Conservancy. Together we can save and protect wildlife around the globe. The Steller’s sea-eagle was named for a noted 18th-century zoologist and explorer, Georg Wilhelm Steller. It is considered the most powerful and aggressive of its closest relatives, the bald eagle and the white-tailed sea-eagle.